Absolutely a beautiful colour, that valencia orange, ovekvam! Didn't like it at first, but now I think it looks amazing! Really stands out from the crowd here. Nice picture of your car with the M performance sticker. I'm now pretty much sold on getting these fitted having seen that. 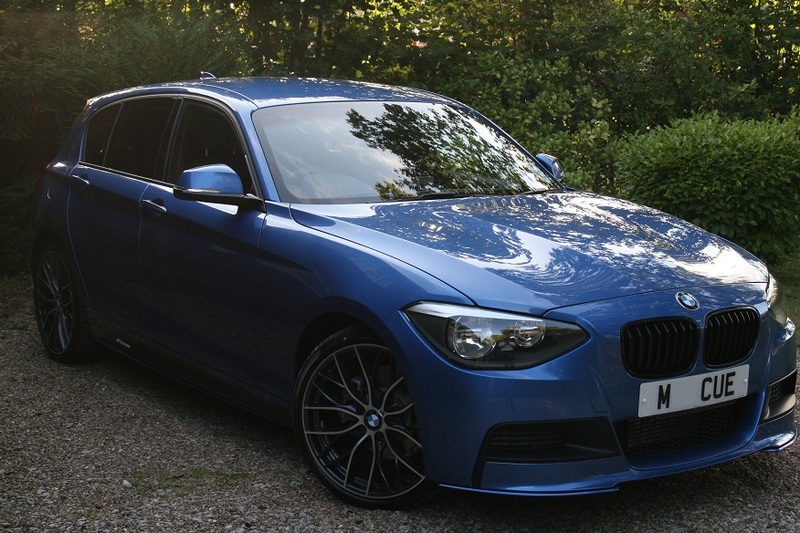 I've had the M Performance Black full gloss kidney grilles fitted as well. Its like looking at my car on the other side of the world! Last edited by F20MAW73; 01-10-2013 at 07:02 AM. Who's car is this ? 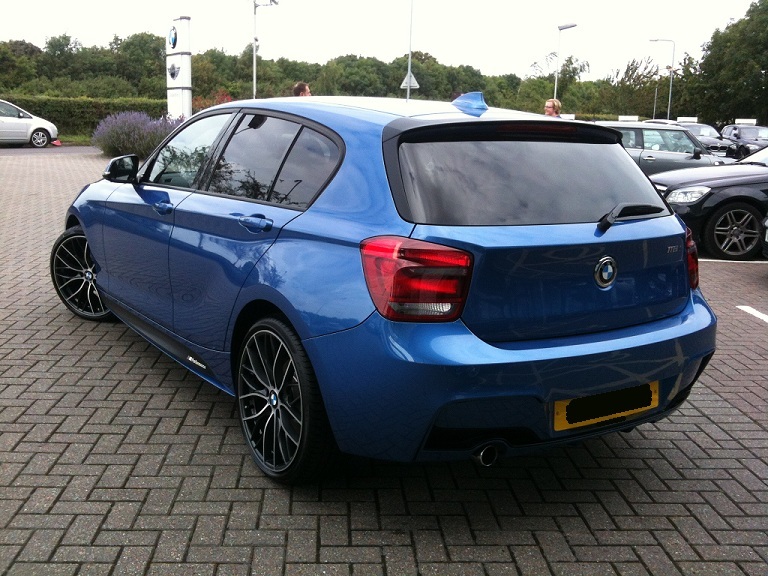 I really would like to see a side-view picture to see what the M Performance bottom-stripe looks like on Estroril Blue !? Thanks ! I love that last picture of the car Aus20.... which again sells the m performance side sill sticker to me. Last edited by F20MAW73; 01-10-2013 at 11:50 AM. agreed re orange ovekram - id put mine up, but mine is so dirty at the moment, its more matte brown than orange! AusF20, looks great! Did you get the performance side decals locally or imported? What did they set you back? I just took delivery of the CF interior parts, rear spoiler and fins and grille - looking for the best price on the side decals now. I got the decals and the other BMW Performance bits fitted as part of my options when I made the purchase. A friend has just been quoted $280.00 for them from the same dealer, so I would say that is the going price in Aus. You could also try buying them on-line through BMW parts. Here's My F20 116i MSport MPerformance Edition! Last edited by MCUE; 01-12-2013 at 10:50 AM. 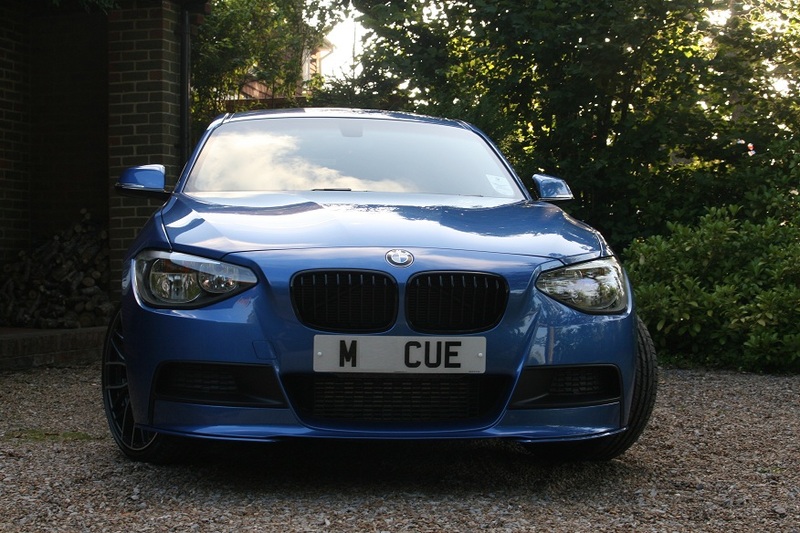 I was going to get the EB on my M135i but I'm having second thoughts. Literally everyone seems to be speccing it although I can see why it does look fantastic. I'm tempted to go for black now, will be the ultimate sleeper car. Mineral Grey looks a bit meh. Here are some pics of my car. I thought those rims were only available with the M135i. I love them! Btw, what are the green things on the mirrors? Thats true but i bought them in Germany. They look so much better then de 17" M wheels. The green thing is a logo from a friend of mine he's company. Well, your car sure is a head-turner, congrats! May I ask what you had to pay for the rims? I'm planning a trip to Germany in the spring to get a few parts, but I didn't see those rims in the price list. Heres some pics of my F20, time to inject some more Valencia Orange into this forum!! Looking good. Do you have more pics ? don't understand why people in the UK are putting winters on their car now... seems like an almighty waste. it's only going to get warmer from now on! 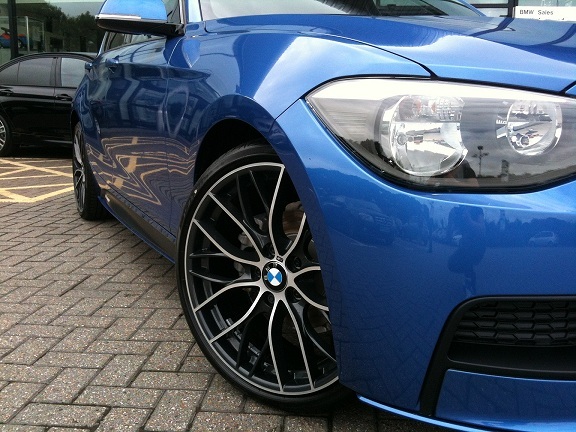 Historically, Estoril Blue is the colour for BMW Performance 'M'. For me, I did not want white, black or silver (previous car colours) so I picked it, and I now know why it was chosen for 'M'. It is one of the colours that takes on different tones depending on the light on it, and it does have that 'WOW' factor. Looking at the all the cars shown here so far, one thing is clear, the 1er looks good in many colours. Here is a picture of the front headlight, which seems to cause a lot of hate and frustration in some countries. I think it looks quite good, but some say it's hideous.